There are lots of good places to camp in the region, some right along the shores of the Chesapeake. Both the Maryland the Virginia state park systems have multiple parks on the shores of the Chesapeake and its tributaries. Camping is a great way to enjoy the natural wonders of the Chesapeake Bay region. Most of the campgrounds listed here provide access to the Bay and its tributaries for boating, swimming, fishing, crabbing, and other activities. Kayaking is an increasingly popular activity in the Chesapeake Bay region. Many campers travel with kayaks, but you’ll also find them available for rent at some of the campgrounds. Most parks in the region are set up for both tent and RV camping. Many of the state parks also have cabins available for rent. There are plenty of commercial RV parks in the area too, some of which offer resort-type amenities such as swimming pools and marinas. Check out our list of regional campgrounds below. The listings are divided into two categories; state parks and commercial campgrounds. Descriptions of the Chesapeake Bay region state parks that have camping facilities are provided below. Clicking on the park name takes you to the state park’s website for additional information. Scroll down below the state park listings to find links to commercial campgrounds in the area. This 733-acre park provides access to the beautiful lower Rappahannock River in Lancaster County. Fishing and Boating are popular here. Bicycle, canoe, kayak, and motorboat rentals are available. Camping sites are available, plus a camping lodge and a rental house and guest house. Reviews. Chippokes Plantation State Park is one of the oldest working farms in the United States. In addition, the park has a wide variety of traditional park offerings, including a swimming complex, visitor center, picnic facilities, and hiking and biking trails. Camping facilities include both tent and RV sites, plus cabin rentals. Reviews. North East, Maryland. Sandy beaches, marshlands and heavily wooded bluffs comprise the peninsula formed by the North East and Elk Rivers and the Chesapeake Bay, where this park is located. An easy walking trail to Turkey Point Lighthouse provides a view of the Elk River and the Chesapeake Bay. Over 250 campsites are available, plus several cabins. Reviews. Virginia Beach, Virginia. A popular campground located in the Virginia Beach resort area. Features fishing, trails, environmental education center. Camping sites are available for tents, pop-ups and RVs. There are also cabins available for rent. Reviews. Cape Charles, Virginia. Located on the eastern shore of Virginia, this park offers recreational access to the Chesapeake Bay and the chance to explore a unique coastal habitat featuring a major flyway for migratory birds. Camping sites are available for tents, pop-ups, and RVs. Other options include a bunkhouse, Yurts, lodges, and RV trailers for rent. Reviews. Scotland, Maryland. Located on a peninsula formed where the Potomac River empties into the Chesapeake Bay. There are 143 wooded campsites available; 26 of these have full hook-ups. 27 have electric. The park also has six cabins available for rent. Reviews. Jarretsville, Maryland. In Harford County, three miles northwest of Havre de Grace, off RT. 155, 35 miles from Baltimore. The park features a boat launch, campfire programs, campsites, cross-country skiing, fishing, flat water canoeing, hiking trails, historic interest, pet trail, picnicking, pavilions, playground, riding trails, bow hunting area and archery range. 69 campsites, six with electric, and six camper cabins. Reviews. The park’s Horsehead Cliffs provide visitors with a spectacular view of the Potomac River. In addition to the scenic beauty at Westmoreland, the park offers hiking, camping, cabins, fishing, boating and swimming. Reviews. Bay Shore Campground. Waterfront campground in Rock Hall, on Maryland’s Eastern Shore. Reviews. Bethpage Camp Resort: RV resort with lots of amenities, including a water park. Urbanna, Virginia. Reviews. Camp Merryelande Vacation Cottages. Cottages and camp sites on the Chesapeake Bay. St. George Island, MD. Reviews. 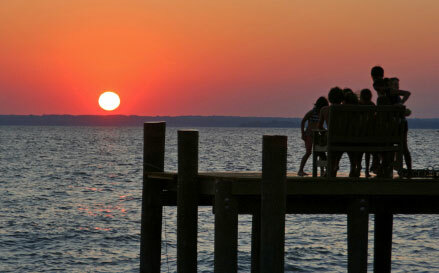 Cherrystone Family Camping Resort: Waterfront Chesapeake Bay campground. Cheriton, Virginia. Reviews. Chesapeake Bay Camp – Resort. RV park on Virginia’s Northern Neck. Reedville, Virginia. Duck Neck Campground. Riverfront RV park with seasonal RV, overnight RV, and tent camping. Chestertown, Maryland. Gloucester Point Family Campground. A Jellystone Park Camp-Resort on the Severn River. Hayes, VA. Reviews. Grey’s Point Campground. RV resort on the Rappahannock River with a marina. Urbanna, Virginia. Gwynn’s Island RV Resort and Campground. Waterfront campground with cottages, RV & tent sites. Gwynn’s Island, Virginia. Harbor View Campground. Waterfront RV campground with a marina. Colonial Beach, Virginia. Reviews. Heritage Park. RV and tent camping along Cat Point Creek on Virginia’s Northern Neck. Warsaw, Virginia. New Point RV Park. Waterfront RV resort with a marina. New Point, Virginia. Reviews. Rainbow Acres Campground. Waterfront campground with cabins, full hook-ups, and primitive tent sites. King & Queen Courthouse, Virginia. Reviews. Roaring Point Waterfront Camp. Waterfront campground with RV and tent sites. Nanticoke, Maryland. Reviews. Sandy Hill Family Campground. Waterfront RV and tent campground on the Nanticoke River. Quantico, Maryland. Reviews. Tall Pines Harbor Waterfront Campground: Waterfront campground on Virginia’s Eastern Shore. Sanford, Virginia. Reviews. Chesapeake Bay Resorts – Stay at one the Chesapeake Bay region’s resort hotels.